Rowing is one of the oldest AAGPS Sports, held since 1893. Newington entered the Head of the River for the first time in 1921 and won it on debut. Newington has a dedicated ‘rowing gym’ at the Stanmore Senior Campus called the Michael Morgan Rowing Centre, with rowing machines, cardio and weights equipment solely for the Rowers. The Rowing Centre caters for entire rowing squads and it is open throughout the year. The Rowing Centre enables time efficient training sessions and provides a backup training venue when there are adverse weather conditions. Rowing training is methodical with a natural progression from Year 7 to Year 12. The training program is customised for each age group using best practice training methods. 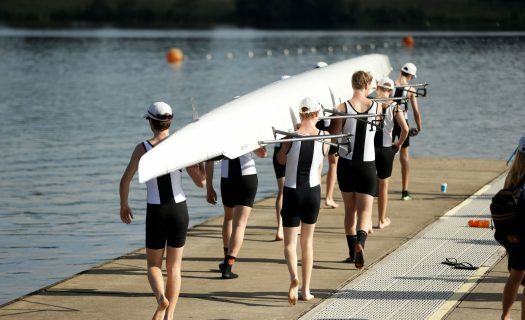 The senior rowing squad stays at the boatshed two nights a week and are transported to and from the boatshed by bus, which is time effective for the students and reduces the travel burden for parents. They complete compulsory study sessions before and after training both in the library and at the boatshed. The boatshed is open most days in the school holidays for any rower that would like to row voluntarily. The AAGPS competition is highly contested across all age groups with up to 24 Newington crews racing on any given weekend in the summer season. For senior crews (boys in Years 10, 11 and 12) the season culminates in the AAGPS Head of the River, which is held in early March. This is one of the highlights of the sporting calendar with crowds of around 10,000 people lining the banks of the Sydney International Regatta Centre, the facility where the Sydney Olympic Rowing Regatta was held. At the 2017 AAGPS Head of the River, Newington was one of only two GPS schools to field the full set of entries. Five of the crew went on to compete at the National Rowing Championships, where the squad won an unprecedented three gold medals in the Under 19 Coxed Four, U19 Double Scull and Schoolboy Quad Scull. Newington was the only NSW school to win a gold medal at the National Championships. Captain of Boats, Alex Nichol was selected in the AAGPS 1st VIII after finishing in the top eight at the AAGPS sculling trials. Three other Newington rowers finished in the top 16 and our 8th ranked sculler from the 1st VIII finished in 32nd place out of all of the GPS 1st VIII rowers. 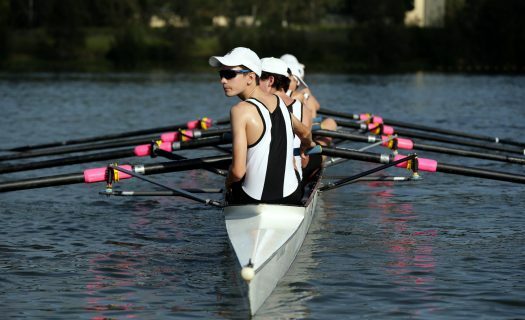 At the Rowing NSW Schoolboy Head of the River, the day after the AAGPS regatta, our squad won an amazing 31 races and won the overall regatta point score. Newington has a proud history of producing rowers, coxswains and coaches who have gone on to represent NSW and Australia in rowing. The College rowing program has produced fourteen Olympic rowers, many of whom have won medals. Newington has produced several Australian representatives at senior, Under 23 and Junior levels. At the 1996, 2000 and 2004 Olympics, there were four old boys in each of those Olympic Rowing teams – a remarkable achievement indeed! In 2012, Newington had representatives at all three levels of the Australian team including James Chapman (ON 2007) at the London Olympic Games (Silver Medallist), Scott Woodward (ON 2008) at the Under 23 World Championships and Jesse Coyle (ON 2012) at the Junior World Championships.